There are several varieties of common carp including scaled (pictured above), line carp (which have a single row of scales along the lateral line) mirror (which have a body partially covered in scales, Leather (which has no scales) and the ornamental carps including koi, which are bred for their colouration. 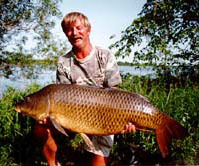 Common carp can grow to over 20kg in the wild, but usually these fish are very old and the exception. Carp are very hardy fish and are also omnivorous. This makes them ideal candidates for extensive farming methods. They can tolerate very low oxygen concentrations and prefer warm water (>15oC) for growth. To breed they require temperatures of greater than 20oC. Many carp farms use hypophysation techniques to assist in the breeding process.